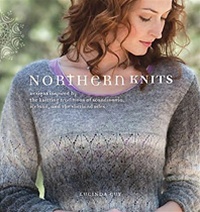 Northern Knits Designs inspired by the knitting traditions of Scandinavia, Iceland, and the Shetland Isles. Inspired by folk traditions and the wholesome purity of natural wool yarns, this collection of 20 stunning patterns for both traditional and contemporary women’s garments and accessories is perfect for the modern knitter. The traditions of the quintessential knitting cultures of Iceland, Shetland, Norway, and Sweden are examined, from descriptions of the wools and yarns to the history of the clothing traditionally made from them, including breathtaking photomontages of these classic vintage styles. Exploring a range of techniques and knitwear construction, the projects in this guide feature knitting in the round, steeking, lace, cables, Fair Isle, twined knitting, and embroidery and show how to create pieces such as cardigans, sweaters, blouses, scarves, and hats.